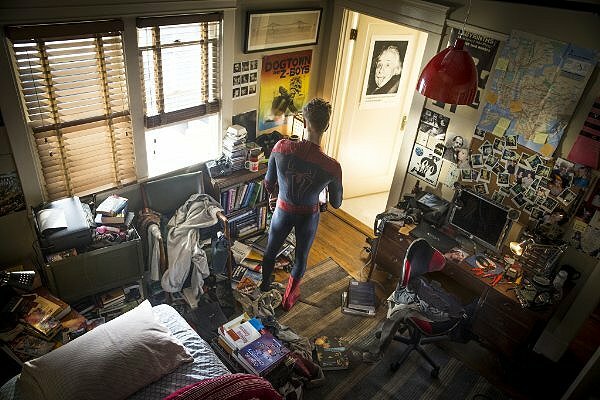 Like Peter Parker’s room, this film is a mess. Superhero movies are big these days, but a small group of filmmakers are discarding the fundamental characteristics that make these heroes who they are in the comics and re-designing them to fit whatever story the writers feel like putting together. First, “Man of Steel” took Superman and turned him into a murderer; now “The Amazing Spider-Man 2” has taken Peter Parker and turned him into a guy with daddy issues who’s following his destiny by carrying on his father’s battle against a hugely powerful corporation. At first look, this film is a poorly-strung-together string of scenes involving a common cast. Start poking at it, and it becomes increasingly clear that this version of Peter Parker / Spider-Man has almost no volition of his own. He wants to break up with his girlfriend Gwen (Emma Stone) because her father strong-armed him into promising to do so, but doesn’t break up with her because she gets angry at him for not respecting her choice to stay with him. He finally looks into what his parents were doing when they abandoned him with his Aunt May and Uncle Ben, but only does so due to promptings from fate. As supervillains begin to appear, they have all been created by the omnipresent Oscorp. As Peter starts investigating what happens to his parents, his clues are all revealed by accidents rather than by his own cleverness, and once the supervillains start showing up, it becomes increasingly clear that rather than Spidey’s activities being dictated by his desire to use his powers responsibly, everything from his powers to the people he fights can be traced back to Oscorp. Moreover, everything is foreordained: Spider-Man is stepping into his destiny and facing inevitable situations rather than setting his own path. “The Amazing Spider-Man 2” has had the worst opening weekend of any Spider-Man movie in the recent pair of reboots (Sam Raimi’s three films starting in 2002, plus the run with Andrew Garfield starting in 2012). Even 2007’s “Spider-Man 3,” which was widely panned, did better. Sony seems determined to run the franchise into the ground rather than let the film rights to Spider-Man revert to Marvel. It’s a pity, because the production values of “The Amazing Spider-Man 2” are very good. The cast is solid, Garfield brings a goofiness to the title role that’s endearing, and the special effects are excellent. Unfortunately, it’s all wasted because without a decent plot, all the prettiness in the world can’t make a movie good. Worse, even the little Easter eggs thrown in for fans are awful – Doctor Octopus’s appearance in a future film is foreshadowed, but in a way that makes it painfully clear that Sony is completely changing his origin story. If you’re the kind of moviegoer who just wants to watch pretty pictures and can ignore incoherent plotting and violations of the fundamental motivations and themes of an existing canon, “The Amazing Spider-Man 2” covers all those bases. Folks who actually like Spider-Man as a character, who are invested in Peter Parker as a person, should stay far, far away.